i am looking into using ESPeasy for my home automation system on FHEM basis. Right now i am still using Mysensors, but the often really bad NRF24 clones are really killing me. The "who is at home" key holder, it has 4 magnetic 1-Wire readers and every key has a I-Button with unic SN attached to it. The reader works with the 1-Wire protocoll and this i can not find here (yet). Do you now any clues if this has been done yet with easyesp? that reader is not supported atm as far as i can see. compatible to the Dallas 1wire. It might be possible for one of the dev's to derive a plugin for your readers from one o the existing plugins. Please give some more info about the readers you use. As far as i can see from the "Loxone"
webpage it seems to use the Dallas protocoll but i'm not sure. Do you use the "Loxone"? If everything else goes wrong there are some other possibilities. - ESPEasy can use RFID readers (Wiegand or PN532). - FHEM has a "presence" module. I use it to check presence by detecting smartphone bluetooth. Yes I use the original Dallas ones. I will check on the weekend. ( as I had to travel for business...). And provide feedback. I just tried to get it runnig with the DS18B20 option, but no luck. Also the IButton reader only has 2 Wires. I guess i need to lok into the ProMiniExtender could this work? as i do already have a working script for the Arduino. If it has 2 wires it uses "phatnom voltage". Add a 10 KOhm resistor from 3,3V to the data wire. i guess i need to get rid of the temperature part and make it search for the adress every x seconds and the use the adress, lets see. 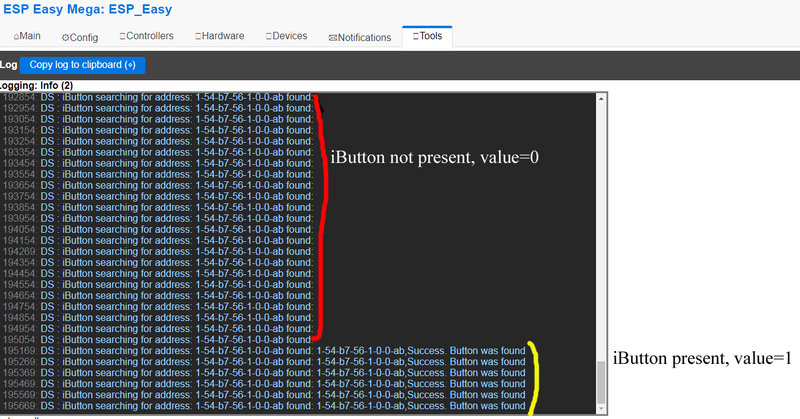 I have just created a pull request for the IButtons. Thank you for the plugin. 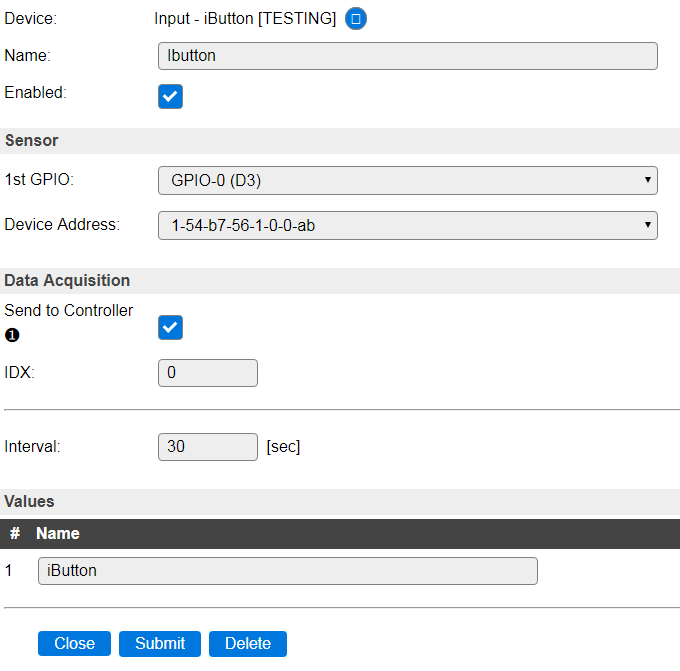 i see the ibutton with the right address in my devices, but the (FHEM) controller dosn't send State-informations to my fhem espeasy module. I'm testing the iButton plugin. --I do not get anything on the controller. --the port is not filled. Don't have a button myself. But shouldn't the interval be set to 0? but nothing in the controller. I mean the interval set in the plugin. You have it set to 30 seconds, try setting it to 0.
impossible to set the interval to 0.
but with 1, still nothing. I tried with a dummy, it does not work. I compared in IDE Arduino the plugin P080 iButton and P004 Dallas. regrettably, I can not compile with IDE Arduino. I don't have that hardware myself. I suggest you add an issue on GitHub. I set the plugin up and everything works, except sending the states of the readers via MQTT. I activated the checkbox "send to controller", still nothing. Can someone help? is here anybody still looking into 1-Wire ibuttons for espeasy?